There are several genes involved in determining the color and pattern of a rabbit’s fur. The topic of rabbit color genetics is sufficiently complicated to warrant whole books on the subject. (Check out “A book About Bunny Colors” here.) This page will consider only the En/en gene, which determines whether a rabbit will be a solid, broken, or Charlie. What Are Solids, Brokens, and Charlies Anyway? This black otter lop is considered a Solid rather than a broken, but as you see it's not one single color all over. It's a solid because it's not white-based with colored patches. To say that a solid rabbit is the same color all over, isn’t exactly accurate. 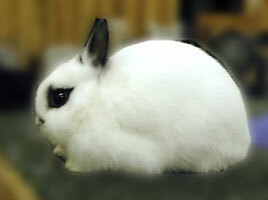 Some solid rabbits, such as smoke pearl are one color on the back and are shaded on the nose, ears, feet, tail, etc. Otters can be white, tan, or light gray on the tummy, behind the head and around the nose and eyes. But one thing that all solids have in common is that their pattern is not interspersed with white fur (not accounting for Himalayans). Broken patterned Holland Lops can be any color of Holland Lops, except that the colored portions occur in a patched or a blanketed pattern with white fur in between (blanketed is more common in Holland Lops). Ideally, a broken patterned Holland Lop should have a balanced marking on its nose (no preference is supposed to be given for a full butterfly). The ears should be totally colored and the front feet should be white. The fur around the eye should be appropriate for the color of the rabbit, uninterrupted with white. The amount of colored fur should fall between 10 and 70 percent, and should be evenly distributed. 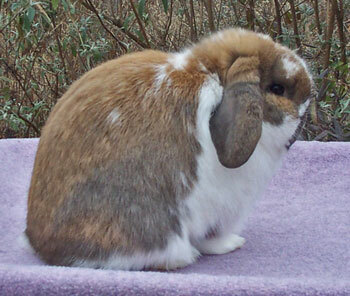 Although a broken pattern Holland Lop will be faulted for incomplete butterflies, white fur on the ears, and incomplete color surrounding the eye, they should not be disqualified unless there is complete absence of color in nose markings, around eyes, or on ears. Since color and markings together only count four points out of 100, a fault in these areas should not weigh heavily. However, a disqualification means that the rabbit cannot compete at all. Some broken Holland Lops may look like Charlies, but Charlies are distinctively different genetically. These rabbits are false Charlies. If either of a rabbit’s parents is solid, the rabbit cannot be a Charlie, as will be discussed below. If a rabbit ever produces even one solid offspring, it is not a Charlie. You will see why shortly. What Are They, Genetically Speaking? The broken pattern gene, En, is dominant over the solid pattern gene, en. Thus, it takes only one broken pattern gene to produce a broken. With two broken pattern or En genes, you get a Charlie. Thus a solid rabbit is en-en, a broken is En-en and a Charlie is En-En. That’s pretty basic and not hard to understand, but let’s look a little bit at what it takes to produce each pattern and what happens when we breed the various patterns together. What Happens When You Breed? Note that REW’s and BEW’s are not necessarily genetic solids! You’ll get some solids and some brokens… at least as a rule. When I first started breeding Holland Lops, I assumed that breeding two broken patterned Holland Lops would yield a litter of all brokens. When I was told that they could produce solids as well, I couldn’t visualize how that would happen. But once you see the combinations, as listed below, it is easy to see that, on the average, 1/2 of the offspring from two brokens will also be broken and 1/4 of the offspring will be solids. The remaining 1/4 will be Charlies, the sparsely patterned broken. Possibilities are some broken, some solid, and some charlie. The last possible combination is Charlie to Charlie. As you can guess, all of the kits will be Charlies, since both parents have only the En gene to contribute to each kit. You’re gonna get all charlies. What Does This Mean To Your Breeding Program? Probably the most common breedings will be solids to solids, and solids to brokens. Some breeders never breed broken to broken or rarely do because they do not want to produce Charlies. There are few, if any, good reasons to breed a broken or a Charlie to a Charlie. You can determine from the chart above that your barn could become unbalanced between solids and brokens if half of your breedings are solid to solid, and half are solid to broken. Eventually your solids would outnumber your brokens 3 to 1. That’s where a good Charlie can be a real boon to a breeding program. When you breed a Charlie to a solid, you know that all of the kits will be broken. Occasional Charlie breedings can help keep your number of broken offspring in line with your solid offspring, should you find you are producing a higher proportion of solids than you would like. Another great use for a Charlie buck is to use him as a backup sire. For example, if you are breeding a solid doe (this technique does not work with a broken), with a solid buck who is unproven, you can add a breeding from a proven Charlie to either increase the litter size or increase the chances that the doe will catch. Any solid kits would belong to the solid buck and any broken kits would belong to the Charlie. This technique could also be used when a solid buck refuses a solid doe for a second breeding. Many breeders breed their does twice to increase the chances of pregnancy and to increase the litter size. But less sexually assertive bucks may not be able to arouse the doe a second time or may not show interest in mating a second time in one day. The Charlie buck could be used for the second breeding. Again, the solid kits would belong to the solid buck and the broken kits would belong to the Charlie buck. The rabbit above is a broken. Genotype is Enen. It has very limited color, however. So we call it a “false charlie”. A true charlie will only rarely have a full nose marking like this rabbit has. This rabbit is also a broken, but has a much heavier pattern. We call this “blanket pattern”. As long as the pattern is even, no preference should be given for blanket or spotted pattern — except in the breeds that disqualify over 50% color. Holland Lop is not one of those breeds. Check out the next article for information on the Dwarfing Gene in rabbits, and its impact on your ability to produce show quality animals.